By 1891 Henry Martin Bradley was a wealthy man and so he began to think of his legacy. He commanded his five children and their spouses and 15 grandchildren to travel to Chicago for a family photograph. He paid for the train tickets, the hotel rooms and the restaurants. His youngest, Adie May Bradley Norpell had to travel from Ohio with her husband and two young children. A large negative was made in a Chicago studio and he purchased enough 13 1/2 by 20 inch prints to be framed and delivered to his five children as well as himself. Growing up this portrait was always hanging in our living room, first in Duluth and then in Pittsburgh, and it now hangs in our dining room in Alexandria, Virginia next to Henry Martin Bradley’s grandfather clock. At an early age I discovered that the portrait was stuffed in the back with newspapers from Chicago that were dated 1891. I also was able to date the photograph since little Henry Gansevoort Bradley, second from left in the middle row, was born in 1890 and died in 1892 from choking on a peanut. 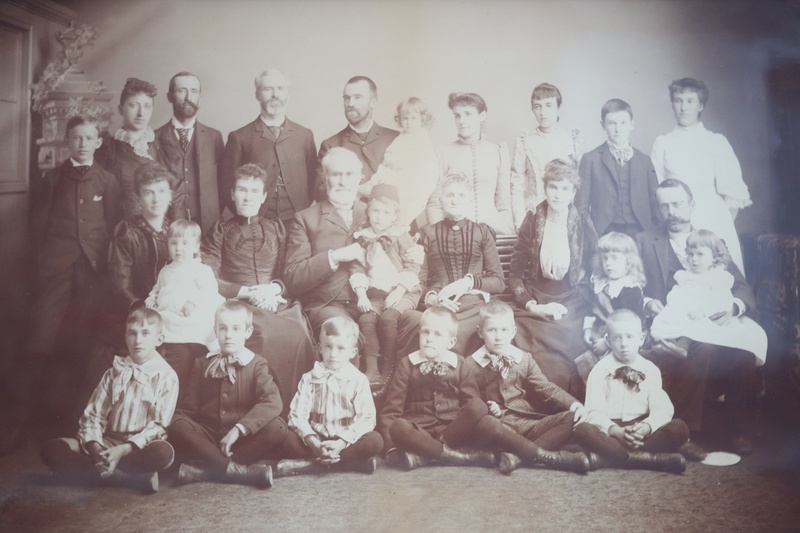 Lucile May Bradley, the baby in the middle of the top row, was born in April of 1890, and Ralph Tenney Bradley, far left in top row, drowned at a Sunday School picnic in Duluth in August of 1892. I knew two of the people in this photograph, Edward Cook Bradley, third boy from the right in the front row, was my grandfather who died when I was five years old, and his sister Lucile, the baby in the top row, who lived to be 92 years old and was able to tell me about her memories of her grandfather Henry Martin Bradley and her father Edward Luther Bradley. Henry continued this legacy by preparing and privately printing the Bradley Genealogy in 1898 and his Autobiography in 1907. Click on photo above to enlarge. See Moving with the Frontier for more information on the family members.